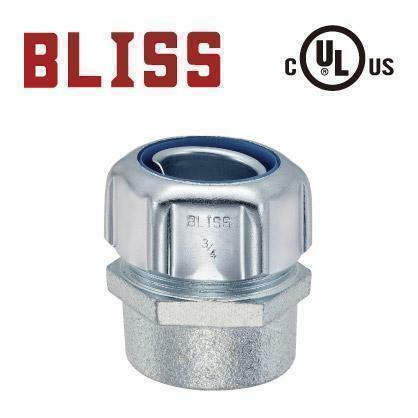 As a well-established supplier and manufacturer in Taiwan, Bliss Yih Enterprise Co., Ltd. has a reputation for offering quality conduit and connectors products. As for the conduit products, the supplier provides its customers with related items, such as conduit fitting, and flexible tubing. With both good management and advanced technology, the supplier has been recognized as one of the most reliable manufacturers in the construction materials industry since 1978. This purpose-designed conduit fitting is used to connect conduit. Normally, flexible metal conduit will use fitting with a clamp on the outside of the box. Our type C2101 and C2111 are internal (female) threaded fittings to address your special assembly need! Interested in our products? Please send your inquiry to us today! It’s our pleasure to serve you and satisfy all your requirements. ANSI/NFPA 70 NEC article 350. Another type no. C2111 from 2-1/2〞to 4〞with PT thread are available.